London's Gatwick Airport is expected to remain closed until at least Friday morning during the busy holiday period while police and airport officials investigate sightings of drones flying over the airfield. Tens of thousands of passengers were delayed, diverted or stuck on planes Thursday as the only runway at Britain's Gatwick Airport remained closed into a second day after drones were spotted over the airfield. The airport south of London — Britain's second-busiest by passenger numbers — said all incoming and outgoing flights were suspended until further notice on a day when 115,000 people were scheduled to pass through, many en route to seasonal breaks. Gatwick first closed its runway Wednesday evening after two drones were spotted. It reopened briefly at about 3 a.m. GMT Thursday, but shut 45 minutes later after further sightings. Drones were still being spotted into Thursday night, a Gatwick spokesperson said around 10 p.m. GMT, more than 24 hours after their first sighting. 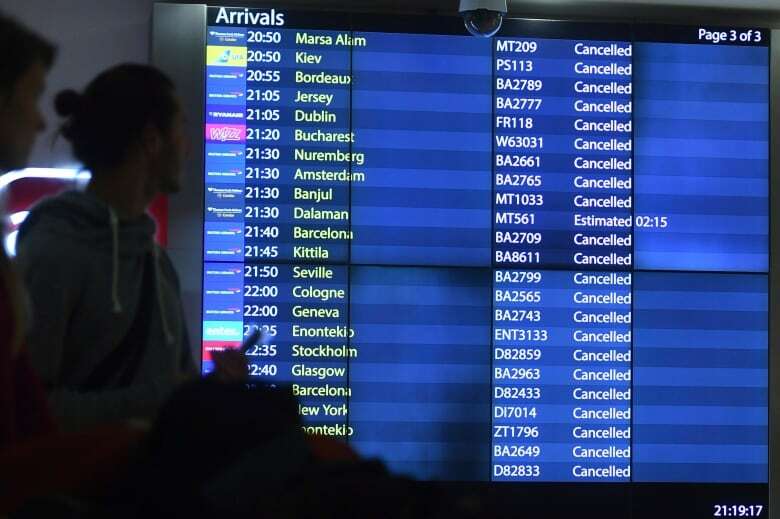 Europe's air traffic control agency Eurocontrol said the airport would remain closed until at least 6 a.m. GMT on Friday. Passengers were advised to check the status of their flights before heading to the airport, where many slept on floors or formed long lines at information desks. Airport chief executive Stewart Wingate said in a statement Thursday that the drone intrusion at Gatwick was "highly targeted" and designed to cause "maximum disruption" just before Christmas. Police said the drone flights were a "deliberate act to disrupt the airport," but that there were "absolutely no indications to suggest this is terror-related." Prime Minister Theresa May's spokesperson condemned the standoff as "irresponsible and completely unacceptable." Two Canadian airlines operate direct flights to Gatwick: WestJet and Air Transat. WestJet told CBC News it has cancelled all regularly scheduled flight to and from Gatwick on Thursday, and was contacting all affected customers. There were 20 police units from two forces searching for the elusive drone operator. Supt. Justin Burtenshaw of Sussex Police said the search was daunting. "Each time we believe we get close to the operator, the drone disappears. When we look to reopen the airfield, the drone reappears," he said. Burtenshaw said new and bigger drones have more reach, making it harder for police to locate the person controlling the flying device. "It's a difficult and challenging thing to locate them, but I've got teams now and I've got investigators looking at how we do that, and I'm confident we will," he said. Gatwick's chief operating officer Chris Woodroofe described one of the drones as a heavy industrial model. "The police advice is that it would be dangerous to seek to shoot the drone down because of what may happen to the stray bullets," he told BBC Radio. "It is clearly our intention to get open again, but only when it is safe to do so," Woodroofe said. <a href="https://twitter.com/hashtag/GatwickDrones?src=hash&amp;ref_src=twsrc%5Etfw">#GatwickDrones</a> | Earlier we appealed for information. We thank everyone for their help but we ask that information shared with us is focused on the identity or location of the <a href="https://twitter.com/hashtag/drone?src=hash&amp;ref_src=twsrc%5Etfw">#drone</a> operator. We are employing all available options to deal with the drone. Defence Secretary Gavin Williamson said the military would be deployed to help police. He said the armed forces would bring "unique capabilities" but gave no details. Any problem at Gatwick causes a ripple effect throughout Britain and continental Europe, particularly during a holiday period when air traffic control systems are under strain. The airport apologized Thursday on Twitter for the holiday-season delays. Watch: A drone expert talks about regulations around airports. Passengers complained on Twitter that their Gatwick-bound flights had landed at London Heathrow airport or in Manchester, Birmingham and other cities, as far away as Paris and Amsterdam. Canadian Charlotte Mather was trapped at Gatwick after her flight to Toronto was rescheduled for Friday morning. "I think it's crazy that someone would try to fly [a drone] at the airport … and that it's been going on for so long now, so it's obviously on purpose," Maher said. One pilot described "flights diverting all over the place to other airports," on Instagram. "This is why we do not like drones!" Andri Kyprianou, from Cyprus, described "freezing" conditions for passengers who spent the night at Gatwick's South Terminal. Her flight to Kyiv had been cancelled. "There were pregnant women, one of them was sleeping on the floor. There were people with small babies in here overnight. We saw disabled people on chairs. There were young children sleeping on the floor," Kyprianou said. 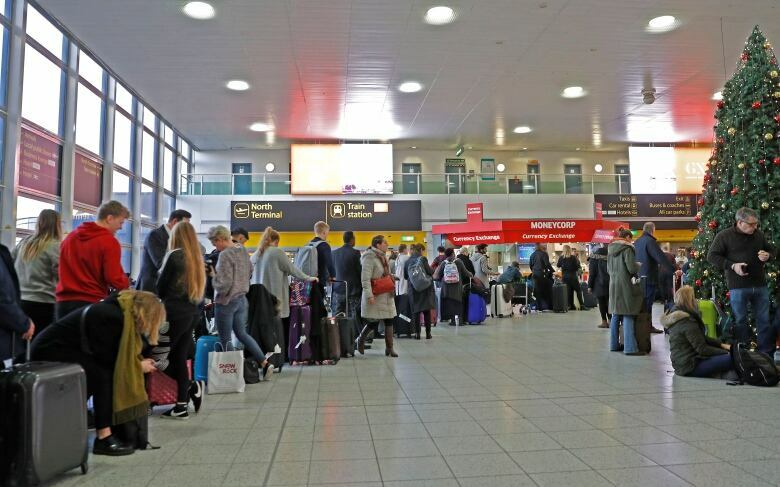 Gatwick, about 45 kilometres south of London, sees more than 43 million passengers a year to short- and long-haul destinations and serves as a major hub for the budget carrier EasyJet. Gatwick normally operates throughout the night but the number of flights is restricted because of noise limitations. The airport website says it usually handles 18 to 20 flights overnight during the winter. The airport briefly closed its runway last year when a drone was spotted in the area. Pilots have reported a sharp rise in "airprox" incidents involving drones in Britain in recent years. Pilots or air traffic controllers in the U.K. may file airprox reports when they feel the distance between two aircraft could compromise safety. 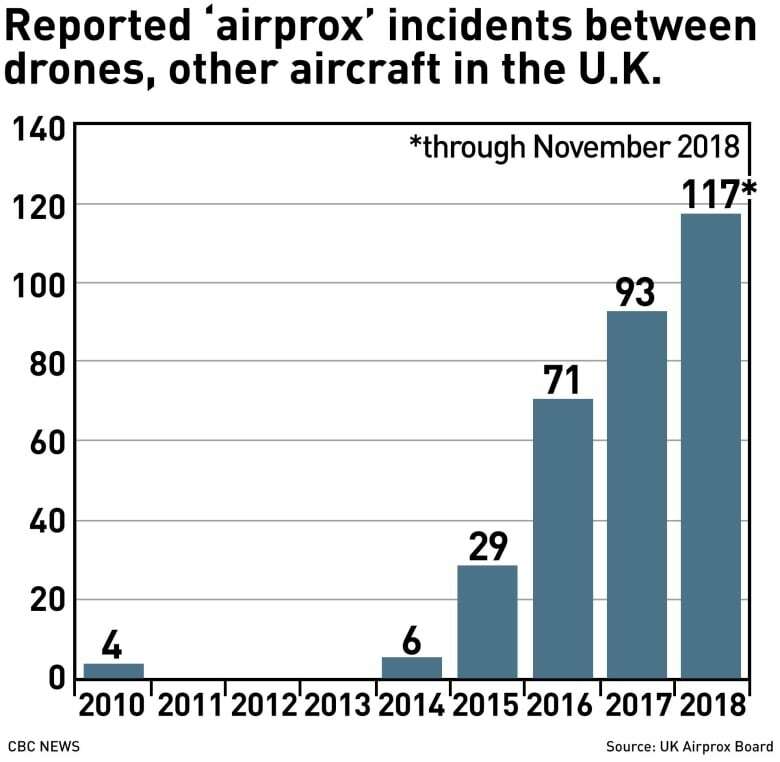 So far this year, the U.K. Airprox Board reported 117 incidents involving drones. Just six incidents involving drones were reported in 2014. U.K. aviation authorities have warned there is a growing risk that a midair collision between drones and planes, which could cause a major disaster. Under British law, it is illegal to fly drones within one kilometre of an airport boundary. Flying a drone near an airport carries a maximum penalty of five years in prison. Christopher Lister, whose flight from Kyiv to Gatwick was diverted to Birmingham in central England, said the scale of the disruption was "a little bit scary." "We feel grateful it's not a worse story this morning about an aircraft [that has] come down," he told the BBC.